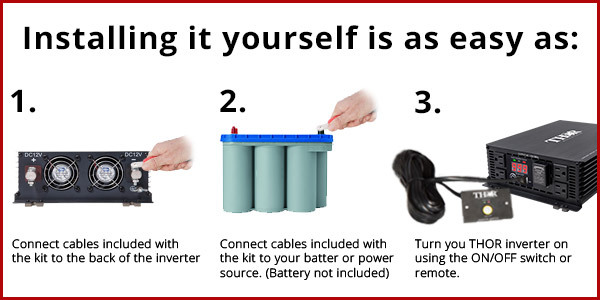 THOR DC Inverter Kits make it simple as 1, 2, 3! Choose your inverter by wattage. Choose the desired accessories you would like with your inverter. Receive all necessary items at once with a THOR Inverter Install Kit. No more searching for fuses, lugs, and cable as they will arrive all in one convenient package. 600 Watt professional grade power inverter kit. Allows connection from power inverter to battery bank. Plug & Play design. Best efficiency and highest safety level. Low maintenance. Strong and compact, THOR power inverters have been designed to support professionals looking for superior performance in an affordable package. Pre-assembled, the Inverter kits allow for a quick, easy and safe installation of the high power THOR inverters and require no special tools. It is imperative, in any inverter’s permanent installation, to use the appropriate material to get the best performance, prevent overheating and avoid added maintenance costs or damages. Use of THOR kits is highly recommended for all mobile applications to ensure superior safety and efficiency. The idea behind this kit is simple. Save time and money, receive everything in one box.